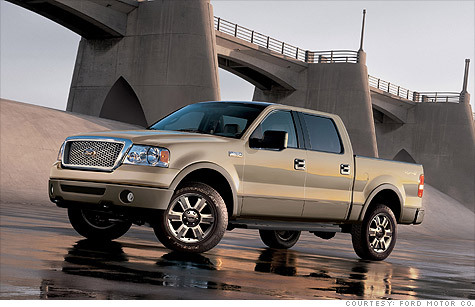 NEW YORK (CNNMoney) -- Ford Motor Co. announced Wednesday it will recall almost 144,000 F-150 pickups in the U.S. and Canada because of a potential airbag problem, but that's a small fraction of the 1.3 million trucks government auto safety regulators asked Ford to recall. The National Traffic Safety Administration has the authority to force Ford to recall all the vehicles it asked for. The safety agency is reviewing Ford's plan and will decide whether it is adequate. The 144,000 trucks Ford is recalling were produced between November 2004 and June 2005 at Ford's Norfolk, Va., assembly plant. In the U.S., 135,000 trucks are being recalled and 9,000 more are being recalled in Canada. Ford said it is recalling only the vehicles made at this plant because the rate of unwanted airbag deployments for these particular trucks is many times higher than for trucks made at other factories. However, there have been unneeded airbag deployments in F-150 trucks made at other plants. These deployments usually happen seconds after the truck is started which reduces the danger, Ford said, since the vehicle is generally in a driveway or parking spot and not driving on a road when the airbag goes off. The problem was caused by an improperly placed wire in the steering wheel, where the airbag is housed. Insulating material on the wire can rub off, causing a short circuit that can lead to the warning lights and inadvertent deployment. In a letter sent to Ford in late January, regulators called the 269 reported incidents of unneeded airbag deployments in F-150 trucks the "most incidents ever recorded in any inadvertent airbag deployment investigation or recall in NHTSA history." The agency accused Ford of downplaying the rate of airbag deployments adding that the rate of incidents will probably increase over time. A warning light indicating the airbag requires servicing usually lights up multiple times before the deployment occurs, Ford (F, Fortune 500) said. Beginning in January, 2006, Ford altered the way the driver's airbags are installed to put a stop to the problem, according to the safety regulator's documents. In the wake of Toyota's highly publicized recalls beginning in 2009 and subsequent record fines for allegedly failing to notify regulators quickly enough of safety defects, other automakers have been quicker to issue recalls. The Ford F-series truck has been the best-selling passenger vehicle in America for almost 30 years. Ford is fiercely protective of the F-150 brand and recently sued Italian automaker Ferrari for using the name F150 on a racecar.